Jack Michonik Isabelle Taudière - Jack Michonik was born in Geneva, Switzerland, of Russian parents and raised in Bogota, Colombia. He attended high school in New York and graduated in Business Administration from the University of Grenoble, France. He then lived in Cali, Colombia for 20 years (1958-1978) before permanently settling in Tel Aviv with his wife and two children.He writes in Spanish and his works include "Eldorado" (Editorial Orlanco, Colombia), “La Novela” (Semana Publishing Co, Jerusalem), "The Unusual Story of Christian White" (Plaza y Valdes, Mexico ), "Como Alma en Pene"* (Plaza y Valdes & Kindle) and he has recently published “Obsesión” ( Kindle). 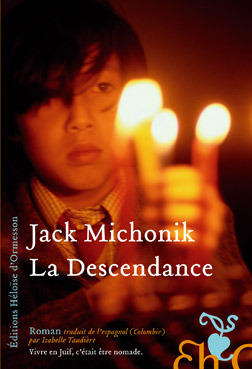 His popular book “La Descendencia” was translated into French as “La Descendance” and published by Éditions Héloïse d'Ormesson in 2009. The corresponding English edition, “The Heritage” was translated and published on Kindle in 2015.